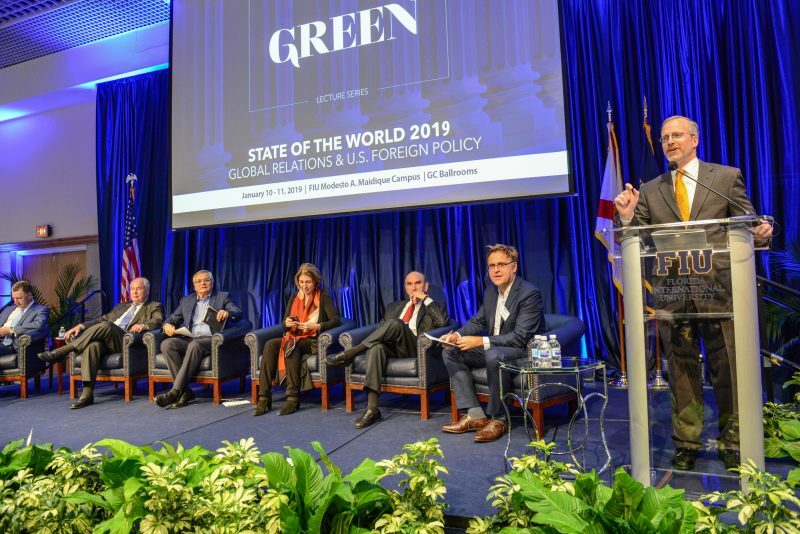 Green School Senior Fellow David Kramer speaks during State of the World 2019. As the federal government shutdown dominated news headlines, attendees of State of the World 2019 were treated to an insider’s view of the chaos in D.C. by some of the top names in political journalism. It was a riveting start to the second annual event of the Dorothea Green Lecture Series, hosted by the Steven J. Green School of International and Public Affairs, along with the Center for Strategic and International Studies (CSIS) and The American Interest. The two-day conference featured more than 30 of the nation’s leading experts in foreign policy and global affairs, including several former ambassadors and advisors to Presidents Reagan, Bush, Clinton, Obama and Trump. On day two of the event, a panel of some of the leading minds in foreign policy vigorously debated whether the greatest threat to democracy lies in China, Russia, the rise of neo-fascism in Europe – or in our own political gridlock. “We are in a pre-crisis era,’’ said Anne-Marie Slaughter, president of New America. “We are heading for some kind of major global crisis. It could be cyber. It could be climate change. Either we’re going to respond as we did after World I and World War II with sufficient gravity … or we won’t have the vision and the leadership” to do that. David J. Kramer, senior fellow in the Green School’s Václav Havel Program for Human Rights and Diplomacy and a former assistant secretary of state for human rights, democracy and labor under President George W. Bush, was the lead organizer of the event. He said he viewed State of the World as an opportunity for FIU students to hear directly from top experts, journalists, political leaders and policymakers about the most critical issues of the day. “It also provides a platform for FIU to shine by showing off its own talent to the broader community,’’ he added, noting the addition of former Costa Rican President Luis Guillermo Solis, now a distinguished visiting scholar at the Kimberly Green Latin American and Caribbean Center, to the roster of panelists this year. Frank Mora, director of LACC, moderated a panel on immigration that included Anne C. Richard, a former assistant secretary of state for population, refugees and migration. Brian Fonseca, director of the Jack D. Gordon Institute for Public Policy, moderated “The Mess in the Middle East,” a panel that included Elliot Abrams of the Council on Foreign Relations. 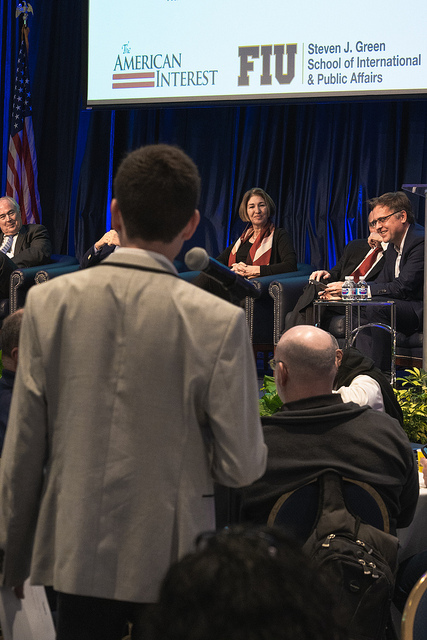 Anne-Marie Slaughter of New America listens as a student asks a question during State of the World 2019. “That FIU talent on display includes our amazing students who asked great questions and really impressed our out-of-town visitors,” Kramer added. One of the out-of-town visitors attending State of the World for the second year was Elisa Massimino, former president of Human Rights First and a senior fellow at Harvard University’s Carr Center for Human Rights Policy. Massimino took to Twitter to share her impressions of the event – and of FIU’s students. State of the World 2019 also included the release of FIU’s 2018 Cuba Poll, the longest running research project measuring Cuban-American public opinion. The poll – the first since President Trump took office – revealed Cuban-Americans in Miami are now evenly split on support for the U.S. embargo of Cuba – a striking contrast to the 2016 poll, where only 37 percent of those surveyed expressed support for the policy. State of the World panelists traveled from as far away as Lithuania and Georgia to attend the event. They gathered for a dinner featuring an “off the record” conversation with former Miami Mayor Manny Diaz and Maria Elena Toraño, a groundbreaking Miami executive and entrepreneur who serves on the Green School’s Dean’s Advisory Council, moderated by Sandra Gonzalez-Levy, FIU’s senior vice president for the Division of External Relations, Strategic Communications and Marketing. “FIU – and specifically the Green School – is the perfect place to host this event,’’ he added.